The great attraction was the vocalist Anna Meek, has a very distinctive voice and original way to use it. Sometimes fragments of the group resembled the Colosseum, Van Der Graaf Generator, Soft Machine and Nucleus. The flagship track of the first LP Catapilla (Vertigo 6360 029) 1971' is twenty-five-minute"Embryonic Fusion" - the quintessence of style group,pure poetry progressive rock. After recording their debut album some musicians left the band. Other members-founders Robert Calvert and Anna Meek, Graham Wilson co-opt new instrumentalists and proceeded to record the second album,Catapilla - "Changes" released in 1972 original UK first pressing Vertigo 6360 074 Production: Colin Caldwell, cover-art by Martin Dean, Recorded at Marquee Studios, London..housed in a spectacular die-cut gatefold cover!. Scary cover, too. A giant die-cut catterpillar gnaws its way through the cabbage leaves. Will they come for you too? The lettering is perhaps a bit too tolerantly chosen. Too much trouble to design your own letters? 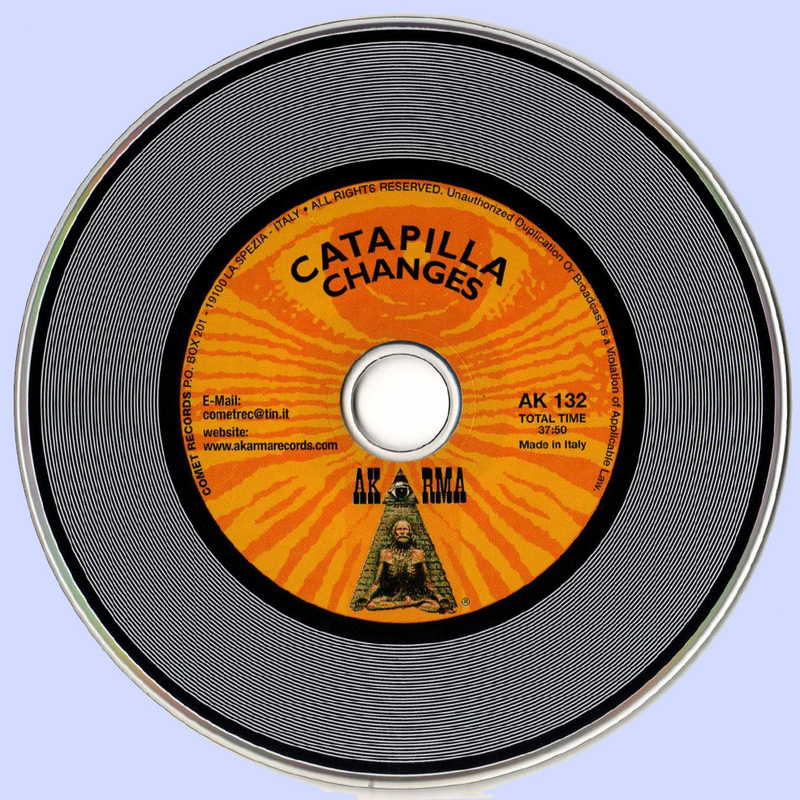 The inside shows the backside of the caterpillar, which is prolongued even into the inside of the cover where the disc has its place. Interesting idea! This LP is rare and very very hard to find,one of the most mysterious of all the innovative acts signed by progressive Vertigo Swirl label in the early seventies. This short-lived progressive rock band made an unforgettable impression upon the face of music before their exit into obscurity. It's a wonder how a group that was so well ahead of their time and who were literally one of the pioneers of an entire generation of music could be so unrecognized. Now its time to give credit were it is so rightfully due. Plate was also curious, as debut the style group remained the same only slightly enriched it even elements of psychedelia and experimental music. It features the powerful vocals of Anna Meek that have been variously described by critics as ‘elegant’ and even ‘witch-like’. Her voice is complemented on a series of extended performances by the saxophone playing of leader Robert Calvert (who is not to be confused with the singer and poet Robert Calvert of Hawkwind fame). 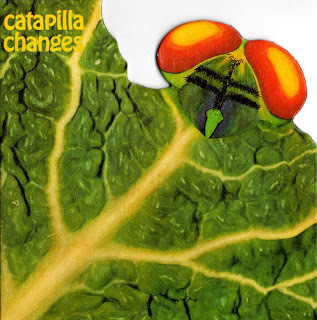 Catapilla’s style veers between avant-garde jazz-fusion and experimental acid rock and there is plenty of room for experimentation on tracks Exorcising and often wordless vocals by Meek still dominate the soundscapes, as do Calvert's ubiquitous saxes, frequently two at the time. Also noteworthy: the strange mixture of slow hard-rock and Eastern melodies on Thank Christ for George, moments of savage guitar lines are calmed by vocals that seem to float over the top of a soothing saxophone while the complexity of it all pulls you into another dimension. They both clock in at over twelve minutes each. Regardless of the length of the songs you are left wanting for more as well as the unexpected tranquillity of the closing track. Unique sounds that make for uneasy but rewarding listening. Vocalist Anna Meek and saxophonist Robert Calvert play off of each other and ride the prog-rock roller coaster of ever changing sound. Prog-rock enthusiasts get a glimpse of where groups like Pink Floyd and Roxy Music could have derived some ideas from. Meek's eerie vocal rants and Calvert's poignant and atmospheric saxophone are everything Graham Wilson (guitar), Ralph Rolinson (keyboards), Carl Wassard (bass), and Brian Hanson (drums) needed to launch a sound that is all at once mysterious as it is aurally exciting. This LP entailed four ambitious songs of progressive jazz-rock fusion that help to lend a hand in setting the standard for what was to become a new genre. The colorful gatefold sleeve, which has a picture of a caterpillar peeping over a leaf as it enjoys its meal, opens and there is a maggot squirming. This image is a point of reference to the music, its very symbolic. Progressive rock is very much like the process of birth and rebirth. Catapilla did not have a suitably resilient impresario and good promotion. To the lack of adequate amounts of touring and internal friction in the group soon led to its dissolution. To this lack of proper quantities concert tours and internal friction in the group soon led to its dissolution. Most of the members of the group left the music business and today their names are known only to the a staunch fans. Robert Calvert joined Hawkwind and for many years with great success in this group, he continued his musical career. The fact remains that Catapilla, is more appreciated team today - over 40 years after its debut, than in the years of its activity. All songs written by G. Wilson, R. Calvert and A. Meek unless as else stated. Hey, does anyone have anything to say about how this compares to the repertoire edition? thank you for the review of a great album. However I need to point out some inaccuracies. In one paragraph you say that Robert Calvert from Catapilla should not be confused with Robert Calvert from Hawkwind and at the end you write that Robert - Catapilla's sax player joined Hawkwind. In fact this is a completely different person. Robert carried on playing saxophone with John Steven's Away and Mother Gong to name the few and continues playing professionally to this day. He should never be confused with the Hawkwind guy, who died many years ago. 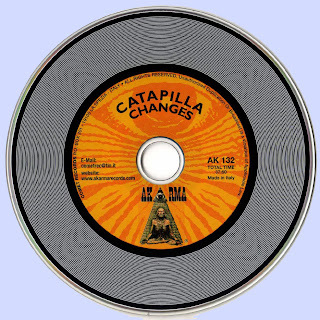 Robert Calvert had never been the leader of Catapilla, in fact the band's philosophy of musical creation was based on the collective writing with each member's contribution. Could you please correct these mistakes in your review? Also, Robert Calvert had never played keyboard in the band. He played alto, tenor and soprano saxophones.